The newspaper job advertising is one of the best recruitment sources for the mass recruitment around the country or region. A recruitment advertisement is designed with only one goal that is hiring fresh as well as experienced employees as per situation vacant for the job that is to be done. It should be compelling enough to draw the attraction of eligible candidates for the job and that is why the designing process of the advertisement should be efficiently done. The newspaper advertisement builds a massive visibility and potential applicants can be motivated to visit a specialized website to apply online. The newspaper job advertising is highly advantageous. The newspaper attracts and the online recruitment answers details and makes the job application simple. So book Recruitment (Jobs) Classified Text ad, Classified Display & Display Advertisements in all Leading Newspaper of India like (Times of India, The Hindu, Hindustan Times, Deccan Chronicle, Dainik Jagran, Malayala Manorama, Daily Thanti, Rajasthan Patrika, Amar Ujala) through Ads2publish. It provides Online Booking Services to publish Classified ads in all Leading Newspapers at the best-offered Rates. Note: Publishing Recruitment Ads on Wednesday, Saturday and Sunday give you more response but if a newspaper has Recruitment supplement on any other specific day then you can advertise on that day. Take advantage of Special Offers like 2+1 Ad Free to save cost on multiple dates Advertising. 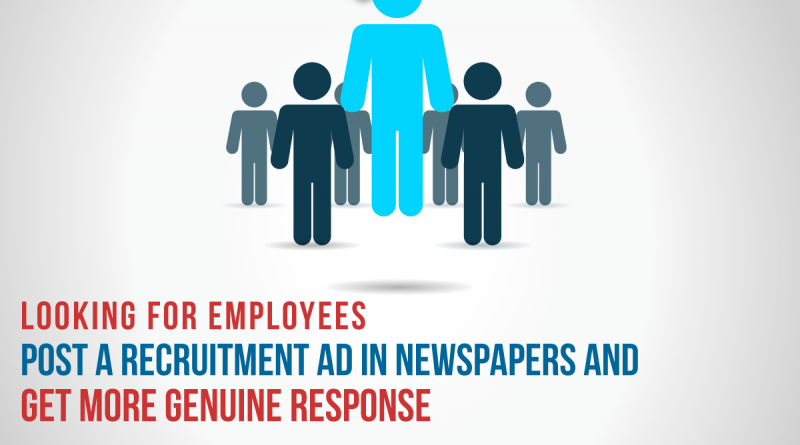 Generally, most of the newspapers provide special offers on Recruitment Classified Ads. There are 3 types of advertisement options in a newspaper. Classified Display Ads gives freedom to the advertiser to design their own ad according to their choice using a different font, vibrant images, and logo of your company. A bit higher on the price scale, classified display ads in the newspaper are more elaborate and eye-catching than classified text ads. They are charged per square centimeter in Newspaper. There is a restriction for minimum and maximum Height and Width to be taken to publish your ad. You can choose B/w or Colour advertisement as the cost may vary for B/w and Colour. Display Ads are calculated based on square centimeter of the ad area used. The tariff for Display Ads is notably higher than the others as multiple columns are required to print this advertisement. For Display Advertisements, there is no Limitation for size. You can choose Full Page, Half Page, Quarter Page or any other size of Ad. And here you have the freedom to choose Page and Position also. You can publish your ad on Front Page, Back Page, Page 3, Jacket Ad, Skybus Ad or a pointer Ad in the Newspaper. Select City from the list of cities to view leading newspapers in that city or if you are sure about newspaper then select from the above list. In next page, select desired date from the Calendar to publish your ad in the selected newspaper. You can also choose Special offers if you wish to advertise for multiple days and then click on proceed to compose your Recruitment Ad. Draft your ad referring Recruitment Ad Samples and make sure you have formatted it effectively. Finally, click on make Payment & pay through Credit / Debit Card, Internet Banking or NEFT payment option which ever is convenient to you. On successful payment, you receive an auto generated invoice from the system confirming your Recruitment Classified Ad Booking. After post editorial approval your Recruitment Ad would publish in the newspaper you have chosen. CIVIL ENGINEERS, required by ISO 9001:2008 Pvt Ltd., company at Hyderabad. Graduates/ Diploma Mechanical/ Metallurgy/ Electrical/ Electronics / Instrumentation Engineers with 3 to 8 years industrial experience in O & M of Furnaces, high Pressure compressors, Sophisticated process plant equipments may apply complete biodata, expected salary Email: engall@abc.com. LOOKING FOR min 2to3 years exp. call center executives 24×7 working environment, should have excellent communication skills in English, Hindi and Telugu Handsome salary, Ealk-in Interviews on 7th and 8th Sep 2013, From 12 to 4pm, at Hi-Com Pvt. Ltd. Contact: 9876XXXX.